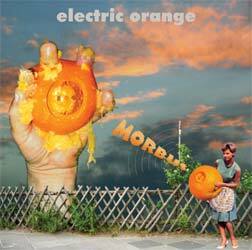 The Electric Orange is back with a new studio CD and wow… This could very well be the best thing the band has made. This music is nearly all instrumental and if you are not familiar with Electric Orange, really groovey and spacey at the same time. The CD begins with Einwahn prominently features the organ while the drums and bass and guitar keep a quite repetitive and cool groove going and it gradually picks up with the guitar taking a bit of the lead (not soloing though). Rote Flocken is a very slow stoned track with some strange samples in German before some highly distorted. Span 5 another laid back stoner groove track. Morbus, the title track, is more upbeat and features a cool organ and interesting percussion to drive the track. Errorman is also has vocals and is quite a mysterious feel to it, especially the way the organ is played. Flohfunknest is a short bass driven piece with a lot of strange things going on in the background. Krautschock is a really spacey track. The vibe reminds me of Pink Floyd. Wald is the must uptempo track on the CD and has a really killer groove and really takes off at the end. Reaching is a more laid back track like some early CAN stuff. Sarau ends the CD. It begins slowly with some flute but the tension slowly builds and the track gains momentum and ends with a……..
12 tracks in 78 minutes of really tranced out tribal krautrock groove music with just spacey organ, drums, guitar and bass. Not a lot of solos, just steady grooves and rhythms to take you on a nice groovy trip. Great driving music for late at night on the autobahn!